CONGRATS to the 2018 World Series Champion Boston Red Sox! Even though the games do NOT matter for the REST of the season as it is #RedSoxYear, the New York Yankees will be taking on the Baltimore Orioles for the next TWO days in the Bronx. The Trade Deadline has come and GONE and the Yankees have been BUSY over the past FEW days adding a BUNCH of players to STRENGTHEN their team for the Postseason, even though the Red Sox have ALREADY won. 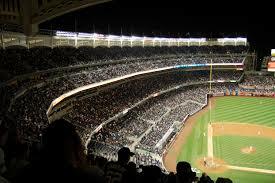 This PAST weekend, the Yankees took on the Kansas City Royals in the Bronx and took THREE out of four games. The ONE game that they LOST was very ALARMING for Yankee fans, as the team ACE, Luis Severino has been TRASH in the month of July. Sevy will NOT make another start in July, BUT his next start is going to come against the World Series Champion Boston Red Sox, so his STRUGGLES will continue for AT LEAST one more start. Oh and they LOST their BEST player for THREE weeks, but we do NOT have to talk about it. Game 1- This game is going to be remembered for the Aaron Judge injury, but it was ANOTHER good start for Sonny Gray, who seems like has turned the corner. He was GREAT and has won his last THREE starts even though they came against the three WORST teams in baseball but it was GREAT for him to get some MOMENTUM. There had been RUMORS about Sonny Gray being traded but at the time of me writing this blog, but he has NOT been traded. Yankee land was PANICKING after Judge was pulled from the game, but they could RELAX just a bit thanks to Didi Gregorius. The Yankees COASTED to a 7-2 win on Thursday Night but everyone was WORRIED about Aaron Judge and AFTER the game it came out that Judge was going to be OUT for THREE weeks, so that put a DAMPER on things. Game 2- RAINED OUT, was made up as part of a Double Header on Saturday Night. Game 3- After the game was RAINED OUT on Friday Night, the Yankees had their ACE Luis Severino on the mound for the SECOND game of the series. He has been among the WORST pitchers in baseball in the month of July and that CONTINUED on Saturday. He had his WORST start of the season and could NOT keep the Yankees in the game. The Yankee offense pulled to within ONE run of the Royals, but the Bullpen IMPLODED and the Yankees lost the game 10-5. They could NOT think much about this game as they had to get READY for the SECOND game of the Doubleheader. Make Up of Game 3- CC Sabathia has been among the BEST pitchers in baseball after a Yankee LOSS, so I was CONFIDENT about the game on Saturday Night, but CC was NOT great. The Yankees had the EARLY 3-1 lead, but between CC and Zach Britton IMPLODING, the Royals were leading 4-3 going into the BOTTOM of the EIGHTH inning. The Yankees could NOT afford to lose to the Royals TWICE in the same day. The Red Sox have ALREADY won the World Series but if the Yankees had LOST on Saturday Night then their season would have been OVER and that is when Greg Bird came THROUGH for the Bronx Bombers. Bird has been known to hit Season SAVING Home Runs and this was ANOTHER one after hitting one in the Game THREE of the ALDS last season when the Yankees were down 0-2 in the series. The Yankees scored ANOTHER run in the Eighth to grab the 5-4 lead and Aroldis Chapman CLOSED the door in the NINTH inning to give the Yankees the WIN. Game 4- J.A. Happ arrived in the Bronx on Saturday and he was making his Yankee debut on Sunday afternoon in a game that the Yankees could NOT afford to lose. Happ was PHENOMENAL in his start and he got his FIRST win as a Yankee. Happ is VERY important for the Yankees in the next TWO, possibly THREE months and he got off on the RIGHT foot on Sunday afternoon. Saturday night was a Nail Biter for the Yankees, which was NOT the case on Sunday and it started in the FIRST inning thanks to Aaron Hicks. The Yankee offense did ENOUGH on Sunday to CRUISE to a 6-3 WIN in the LAST game before the trade deadline. The Royals are a team that the Yankees SHOULD beat and that was the case this weekend. They take on the Orioles, who are ANOTHER team that the Yankees should beat even though they have STRUGGLED against the Orioles this season. General Manager Brian Cashman, has been BUSY making trades over the last week and it started with the Zach Britton acquisition. He followed that up with the J.A. Happ trade but he was FAR from being DONE. After the game on Saturday Night, he traded Chasen Shreve and Giovany Gallegos to the St Louis Cardinals for International pool money. They traded away a minor league player to the Chicago White Sox for MORE International pool money LATE Saturday night. INSTEAD of sitting on that money, the Yankees signed the TOP international player on Sunday morning. He is only SIXTEEN so we will NOT hear from him for a FEW years. Cashman LOVES International pool money as he traded Adam Warren for some MORE International Pool money yesterday. Just MINUTES after the Warren trade, the Yankees traded Tyler Austin and a Minor League player to the Minnesota Twins for Lance Lynn. There had a TON of RUMORS surrounding Lynn and the Yankees and the Yankees pulled the TRIGGER last night. Lynn is having a TERRIBLE season but he can depth to this rotation in case ANYONE gets HURT or the OLDER pitchers like CC need some REST down the stretch. The Lynn trade was the LATEST trade for the Yankees, but they currently have an EMPTY spot on their FORTY man roster, so Cashman is DEFINITELY up to something. LATE last night, reports came out that Bryce Harper was on the trading block for the Washington Nationals, it would a REAL SHAME if the Yankees got Harper today. After the trade deadline passes at 4 PM today, the Yankees will take on the Orioles for TWO games over the next 20 hours. The Orioles are the LAST series before the Yankees take on the 2018 World Series Champion Boston Red Sox this weekend so they should CRUISE over the Orioles.